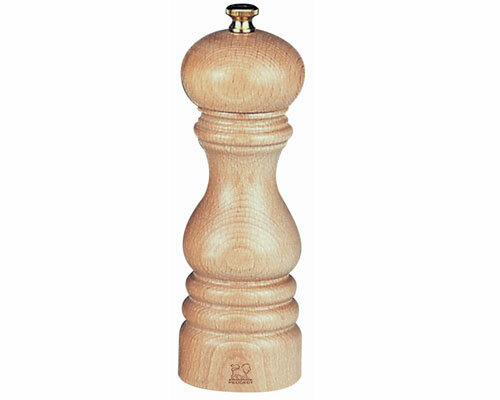 Peugeot created the pepper mill back in 1842, long before they started developing their cars. With their distinguished history, Peugeot has become, and remains the mill of choice for professionals. Peugeot mills feature unique mechanisms that are specific to the spice, so that you get rich flavor. 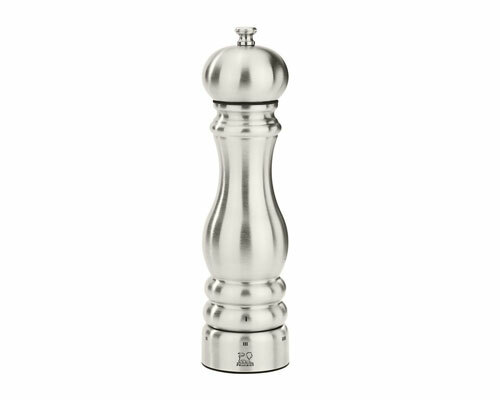 All Peugeot salt and pepper mills are easy to adjust, refill, and feel comfortable in your hand during use. Each Peugeot mill comes with a limited lifetime manufacturer warranty. Made in France. The Peugeot 7 in. Paris Natural Salt Mill was designed to provide the best grind results. The salt crushing mechanism in this salt mill is high quality stainless steel, providing you the best flavor. Made of high quality beech wood with a natural finish. The Peugeot 7 in. 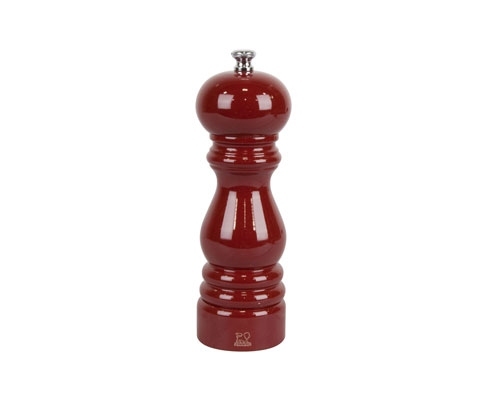 Paris Classic Red Salt Mill was designed to provide the best grind results. The salt crushing mechanism in this salt mill is high quality stainless steel, providing you the best flavor. Made of high quality beech wood with a red lacquer finish. How To Use: Always rotate in a clockwise direction to obtain the best results. Adjust the metal piece at the top of the salt mill to adjust the grind. Turn clockwise to tighten for a finer grind or counterclockwise to loosen for a coarser grind. Construction: Made from high quality beech wood, with a red lacquer finish. Warranty: 2 Year warranty on salt mill body, lifetime warranty on grinding mechanism. The Peugeot 7 in. 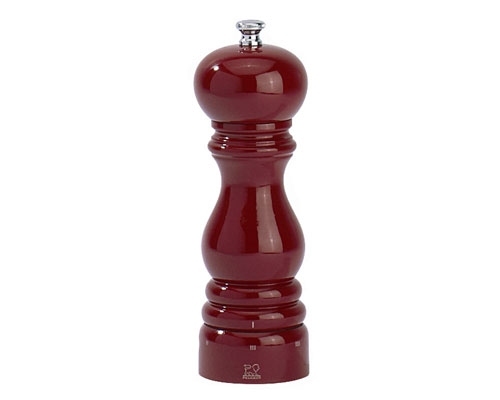 Paris Classic Red Pepper Mill was designed to provide the best grind results. This peppermill works in a very unique way; it cracks the peppercorns before they are ground, providing you the freshest flavor. Made of high quality beech wood with a warm chocolate finish. How To Use: Always rotate in a clockwise direction to obtain the best results. Adjust the metal piece at the top of the pepper mill to adjust the grind. Turn clockwise to tighten for a finer grind or counterclockwise to loosen for a coarser grind. Construction: Made of high quality beech wood with a red lacquer finish. 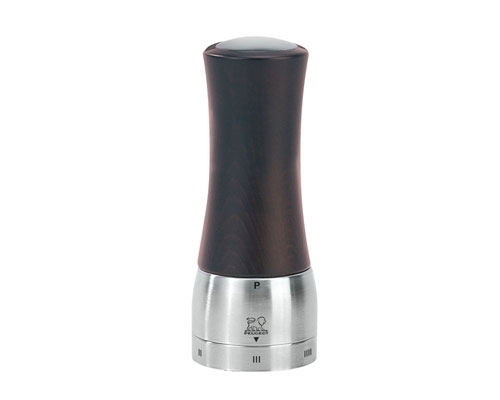 Warranty: 2 Year warranty on pepper mill body, lifetime warranty on grinding mechanism. The Peugeot 8 in. 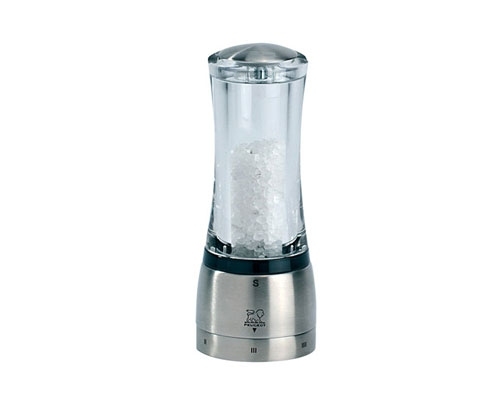 Onxy Electric Black Salt Mill was designed to provide the best grind results. Features a light that illuminates when the salt mill is in use (spare bulb is included). Runs on 6 AAA batteries (included). The salt crushing mechanism in this salt mill is high quality stainless steel, providing you the best flavor. This mill has a soft touch onyx finish. Construction: Soft touch onyx finish. The Peugeot Madras u'Select 6.5 in. Chocolate Pepper Mill is apart of Peugeot's "shaftless" design. The center shaft is removed inside of the mill, providing more space for your the pepper of your choice. The top of the mill features a magnetized stopper that has a wide opening, making it easy to refill. Peugeot's u'Select system features 6 different grind settings; from powdery-fine to very coarse. Simply turn the ring at the bottom of the mill in one direction to make the grind more fine, or turn in the other direction for a coarser grind. Once the grind size is set, it will stay in place until the you change it. The Peugeot Madras u'Select 6.5 in. Chocolate Salte Mill is apart of Peugeot's "shaftless" design. The center shaft is removed inside of the mill, providing more space for your the pepper of your choice. The top of the mill features a magnetized stopper that has a wide opening, making it easy to refill. Peugeot's u'Select system features 6 different grind settings; from powdery-fine to very coarse. Simply turn the ring at the bottom of the mill in one direction to make the grind more fine, or turn in the other direction for a coarser grind. Once the grind size is set, it will stay in place until the you change it. The Peugeot Daman u'Select Shaftless 6.5 in Salt Mill makes it easy to differentiate the pepper mill from the salt mill. The clear acyclic combined with stainless steel gives this pepper mill a sleek and modern look. The center shaft is removed inside of the mill, providing more space for your favorite salt. The top of the mill features a magnetized stopper that has a wide opening, making it easy to refill. Peugeot's u'Select system features 6 different grind settings; from powdery-fine to very coarse. Simply turn the ring at the bottom of the mill in one direction to make the grind more fine, or turn in the other direction for a coarser grind. Once the grind size is set, it will stay in place until the you change it. Equipped with Peugeot’s exceptional salt-grinding mechanism. Its two ribbed plates are made from a stainless-steel blend that offers resiliency, rigidity and resistance to corrosion from dry salts. When the mechanism is activated, the ribs work to twist and fracture each salt crystal to the desired size. The compact Peugeot Molene 5.5 in. 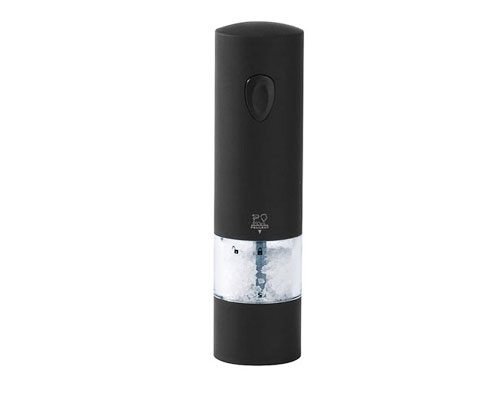 Pepper Mill features a clear acrylic body with a Black top. The grind is adjusted by turning the top nut: turn it clockwise for a finer grind and counter-clockwise for a coarser grind. Comes partially filled with high quality pepper. 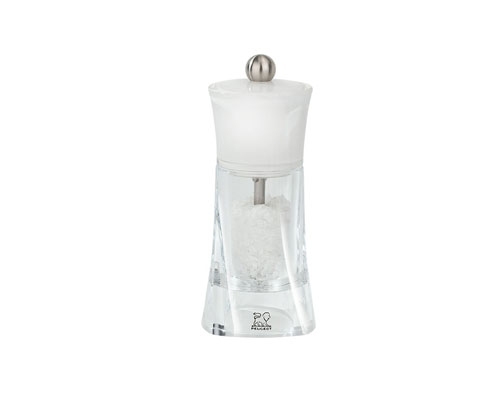 The Peugeot Molene White 5.5 in Salt Mill features an acrylic body with a translucent top. 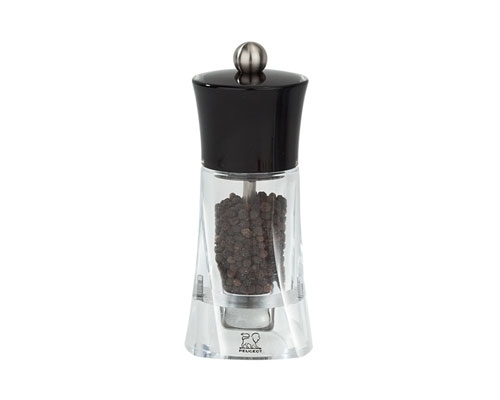 This compact salt grinder is easy to use; Just turn the knob at the top of the pepper mill to pick the size of grind you need. The tighter the knob, the more fine the grind. Peugeot 8 in. 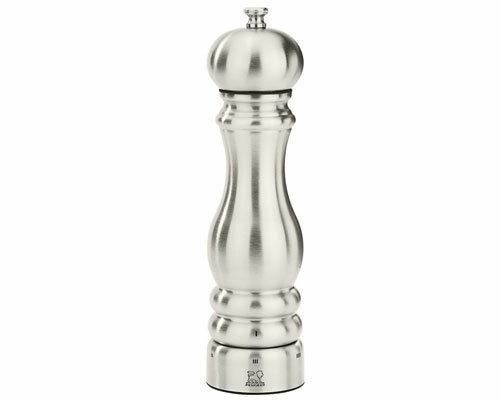 Paris U'Select Stainless Steel Pepper Mill was designed to provide the best grind results. This pepper mill works in a very unique way; it cracks the peppercorns before they are ground, providing you the freshest flavor. Peugeot's u'Select system features 6 different grind settings; from powdery-fine to very coarse. Simply turn the ring at the bottom of the mill in one direction to make the grind more fine, or turn in the other direction for a coarser grind. Once the grind size is set, it will stay in place until the you change it. The 8.6 in. Paris Chef U’Select. Features high-quality stainless steel for durability, a lifetime-guaranteed mechanism and adjustable grind. Whether in the kitchen or at the table, the Chef collection is the ideal companion of the most demanding gourmets. The Peugeot 12 in. 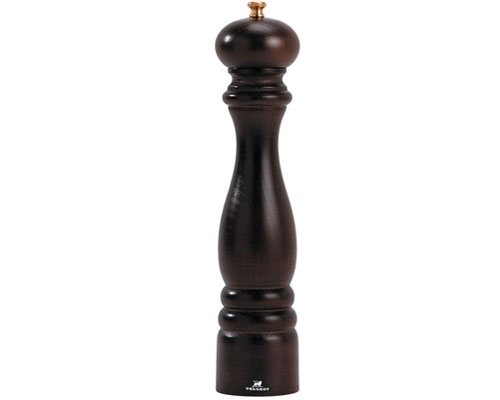 Paris Classic Chocolate Pepper Mill was designed to provide the best grind results. This peppermill works in a very unique way; it cracks the peppercorns before they are ground, providing you the freshest flavor. Made of high quality beech wood with a warm chocolate finish. Construction: Made of high quality beech wood with a warm chocolate finish.